With the demise of the premier grade the previous week, it fell to the mighty third grade to ensure a Cottesloe presence in the premiership finals this coming weekend, and they delivered. The thirst thirds successfully shut down a big and powerful Joondalup side and won this semi final at a canter by a score of 22 points to 8. Although Cottesloe had home advantage, the Joondalup side had actually beaten Cott at the grade two weeks ago and there was a slight air of trepidation around the squad. But they need not have worried. From minute one it was apparent that Cottesloe were the better side. The match began at a frenetic pace with Joondalup looking to put their big men up through the middle but Cottesloe were able to put massive pressure on the breakdown through the defensive work of captain Tony Ansell and Dr Johnny Iliff. After ten minutes, half back James Adie ghosted through the Brother’s midfield and chipped through. In the resulting chaos, predator supreme Nate Howard managed to get his hands on it and he went over for the first try of the match. The conversion was missed but Cottesloe were soon back on the attack. A fantastic touch finder from a penalty by Sam Parker allowed the forwards to set up a rolling maul in the Joondalup 22 and despite giving up a few kilograms all through numbers one to eight, Cottesloe were able to touch down through Cedric “Chou Chou” Pagot. The conversion was landed and Cottesloe went twelve clear. Joondalup did not go back into their shells though and managed to engineer a penalty before the break. The second half began similarly to the first half with some huge shots and powerful carries from both sides, but it was Cottesloe who looked the most threatening. 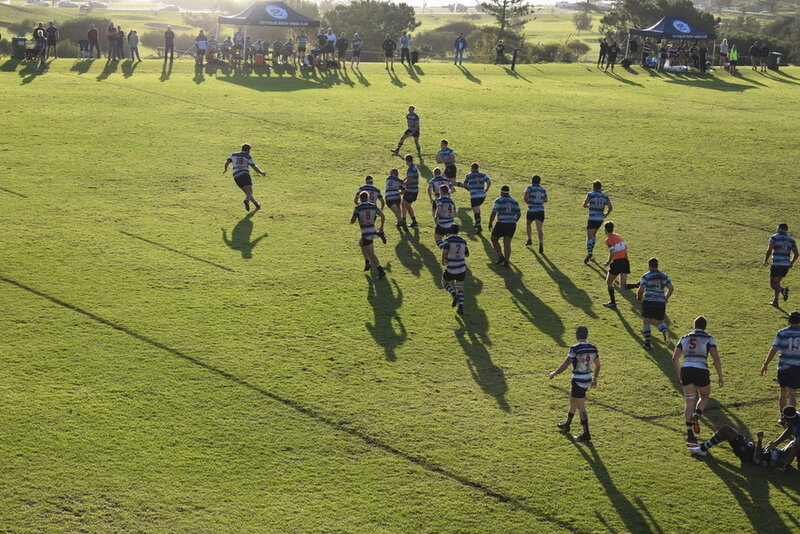 Runs from Gene Carmichael and Nate Howard penetrated the Joondalup flanks and Cottesloe earned another penalty opportunity, Sam Parker converted to put the score out to 15-3. Joondalup enjoyed almost a twenty minute period of possession in the Cottesloe half after this as they looked to claw their way back into the match but got little change from the miserly Cottesloe defence. Davie Kirton rolled back the years and wiped out a succession of Joondalup attackers while club captain Daniel Grace, who is also fond of his physical exchanges, whacked a succession of ball carriers too. Unfortunately for Joondalup, they were caught narrow after a lost lineout and Nate Howard broke down the left flank, running almost sixty metres down the field to break the siege. A penalty was earned shortly afterward and although it was completely shanked, the resulting clearance landed in the bread basket of Sam Parker and Nate Howard ended up going in for Cottesloe’s third try. The match was effectively over at this point and although Joondalup managed a try in the dying minutes they were never within touching distance. It was a fantastic performance from numbers 1 to 22 in reality and the thirsty thirds really “turned up” as the saying goes. From minute one, they were looking to be extremely physical and direct and Joondalup never got to grips with them. If this writer had to pick a man of the match, it would probably be Nate Howard. Powerful in attack and clever in defence he was a constant torment to the Joondalup backline. If he would actually ever pass the ball, he could probably be a Wallaby. The threes now face arch rivals Nedlands in the final at Pat O'Hara Reserve in Bayswater for a 10:15AM kick-off. Nedlands have been fairly dominant in the grade for the last number of years but the lads will be fully confident of taking them on and bringing silverware back to the club. The “Fours For Life” or 44L as they are affectionately known, trounced UWA in the championship semi final by a score of 59 points to 7. Looking to emulate the victorious thirsty threes who won earlier in the day, the fours ripped into the University side from the beginning and absolutely put them to the sword. Jeremy Wallcroft and Billy Cooper went through their midfield like a knife through butter while El Presidente himself, John Cameron gave a fair impression of a piano falling down a stairs as he steamrolled a dozen UWA men on his way over the advantage line. Club secretary Sam Turner’s physicality was something to behold as he put in an evil shift, looking to bring the pain at every encounter with the men in green and yellow. Cottesloemanaged six tries before the break and the scorers were too varied for this writer to even recall. It is probably easier to recall who didn’t score rather than who did. The second half went the exact same way as the first even after Coaches Black and Fairbairn ran the bench. There was no disruption whatsoever and Cottesloe never missed a beat. Billy Cooper and Gene Carmichael ran rings around their opposite numbers. Mike Gallagher was superb from the base of the scrum also and Troy Pixley absolutely dominated in the loose and the tight. UWA did manage to muster a score right at the death but the game was over by that stage with veterans Galsie, Glyn Roberts and Jeremy Wallcroft long retired to the clubhouse for refreshment. The Fourth grade face neighbours West Scarborough at Lark Hill, Rockingham kicking off at 10:30AM on Saturday. With their attack in this sort of form, they will surely be very hard to beat. Newer PostCottesloe Rugby Seeking new Head Coach 2019!